As an important plant hormone, jasmonate (JA) regulates plant immunity and plastic growth. Perception of the bioactive JA ligand jasmonoyl-isoleucine (JA-Ile) by the receptor COI1 leads to “de-repression” of the master transcription factor MYC2. 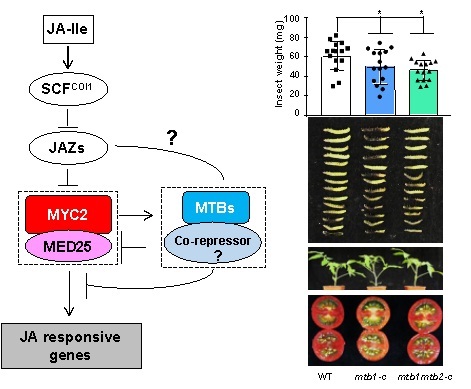 In turn, MYC2 forms a transcriptional activation complex with the MED25 subunit of the plant Mediator transcriptional co-activator complex to activate the expression of JA-responsive genes. However, given that sustained activation of JA signaling can severely inhibit plant growth, turning off JA signaling is as important as turning it on. Researchers from Dr. LI Chuanyou’s lab at the Institute of Genetics and Developmental Biology, Chinese Academy of Sciences, describe an additional and unexpected function of MYC2 in forming an autoregulatory negative feedback circuit that regulates the termination of JA-signaling in tomato. They found that MYC2 and MED25 activate the expression of a group of bHLH transcription repressors termed MYC2-TARGETED BHLH 1 (MTB1), MTB2, and MTB3. In turn, MTB proteins attenuate JA signaling by impairing the formation of the MYC2–MED25 complex and competing with MYC2 to bind its target gene promoters. This work described a highly organized feedback circuit that controls the accurate termination of JA signaling in tomato. “Crucially, the formation of this MYC2-MTB autoregulatory feedback loop is tightly controlled with wound-induced expression of the MTB genes temporally-delayed relative to MYC2. This delay very neatly ensures that the ‘off-switch’ for terminating JA-mediated responses is pre-programmed into the induction phase (‘on-switch’) of JA signaling whilst still allowing an appropriate JA response to proceed.” Highlighted by the Plant Cell IN BRIEF article referring to this work. The work of Li and colleagues has potential applications in sustainable crop production since it may offer a strategy to engineer the relationships between growth and defense. The paper entitled “MYC2 Regulates the Termination of Jasmonate Signaling via an Autoregulatory Negative Feedback Loop” was published in The Plant Cell on January 4, 2019 (DOI: 10.1105/tpc.18.00405). To highlight the importance of this work, The Plant Cell published an IN BRIEF article entitled “Master MYCs: MYC2, the jasmonate signaling ‘master switch’” (doi:10.1105/tpc.19.00004) in the same issue.